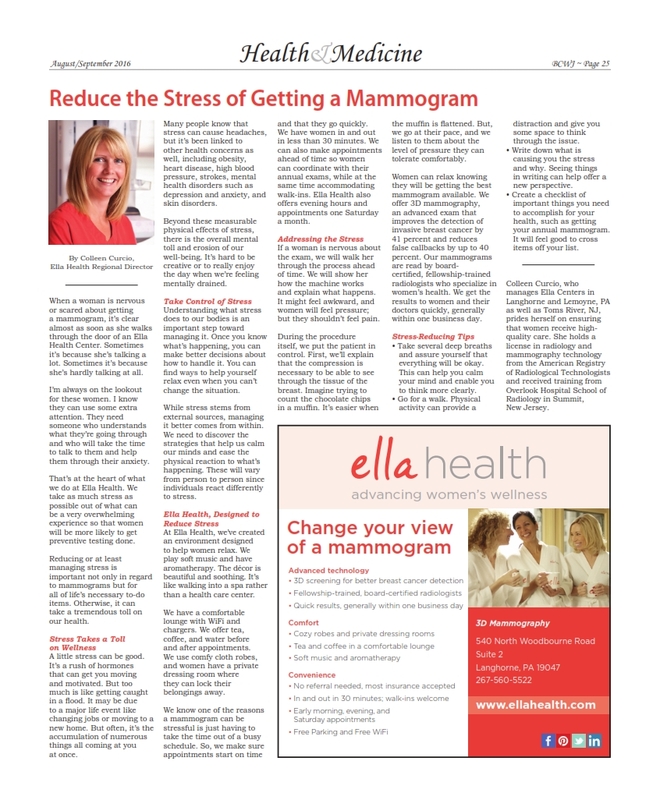 In an article that appeared in the Bucks County Women’s Journal, Ella Health Regional Director Colleen Curcio talked about how to reduce the stress of getting a mammogram. When a woman is nervous or scared about getting a mammogram, it’s clear almost as soon as she walks through the door of an Ella Health Center. Sometimes it’s because she’s talking a lot. Sometimes it’s because she’s hardly talking at all. I’m always on the lookout for these women. I know they can use some extra attention. They need someone who understands what they’re going through and who will take the time to talk to them and help them through their anxiety. That’s at the heart of what we do at Ella Health. We take as much stress as possible out of what can be a very overwhelming experience so that women will be more likely to get it done. Reducing or at least managing stress is important not only in regard to mammograms but for all of life’s necessary to-do items. Otherwise, it can take a tremendous toll on our health. A lot of people know that stress can cause headaches, but it’s been linked to other health concerns as well including obesity, heart disease, high blood pressure, strokes, mental health disorders such as depression and anxiety, and skin disorders. Beyond these measurable physical effects of stress, there is the overall mental toll and erosion on our wellbeing. It’s hard to be creative or to really enjoy the day when we’re feeling mentally drained. Understanding what stress does to our bodies is an important step toward managing it. Once you know what’s happening, you can make better decisions about how to handle it. You can find ways to help yourself relax even when you can’t change the situation. While stress stems from external sources, managing it better comes from within. We need to discover the strategies that help us calm our minds and ease the physical reaction to what’s happening. These will vary from person to person since individuals react differently to stress. At Ella Health, we’ve created an environment designed to help women relax. We play soft music and have aromatherapy. The décor is beautiful and soothing. It’s like walking into a spa rather than a health care center. We have a comfortable lounge with WiFi and chargers. We offer tea, coffee, and water for before or after the appointment. We use comfy cloth robes and women have a private dressing room where they can lock their belongings away. 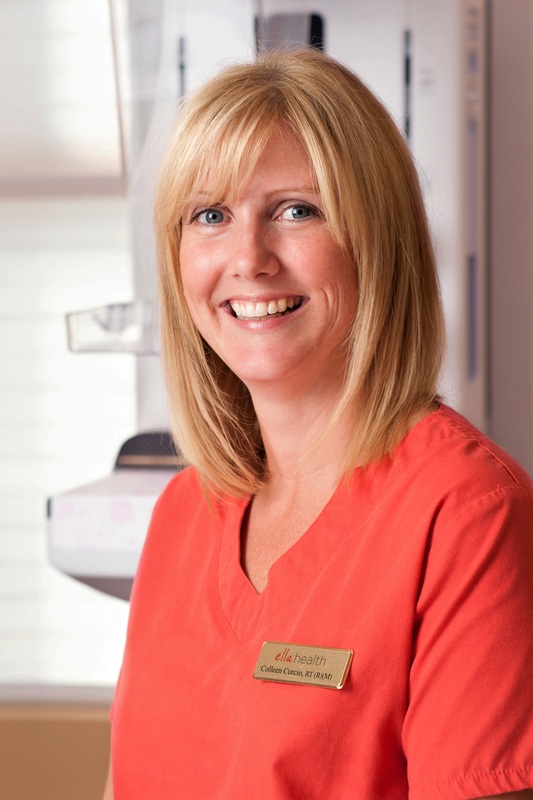 We know one of the reasons a mammogram can be stressful is just having to take the time out of a busy schedule. So, we make sure appointments start on time and that they go quickly. We have women in and out in less than 30 minutes. We can also make appointments ahead of time so women can coordinate with their annual exams, while at the same time accommodating walk-ins. Ella Health also offers evening hours as well as one Saturday a month. If a woman is nervous about the exam, we will walk her through the process ahead of time. We will show her how the machine works and explain what happens. It might feel awkward and women will feel pressure, but they shouldn’t feel severe pain. During the procedure itself, we put the patient in control. First, we’ll explain that the compression is necessary to be able to see through the tissue of the breast. Imagine trying to count the chocolate chips in a muffin. It’s easier when the muffin is flattened. But, we go at their pace and we listen to them about the level of pressure they can tolerate comfortably. Women can relax knowing they will be getting the best mammogram available. We offer 3D mammography, an advanced exam that improves the detection of invasive breast cancer by 41 percent and reduces false call backs by up to 40 percent. Our mammograms are read by board-certified, fellowship-trained radiologists who specialize in women’s health. We get the results to women and their doctors quickly, generally within one business day. -Take several deep breaths and assure yourself that everything will be okay. This can help you calm your mind and think more clearly. -Go for a walk. Physical activity can provide a distraction and give you some space to think through the issue. -Write down what is causing you the stress and why. Seeing things in writing can help offer a new perspective. -Create a checklist of important things you need to accomplish for your health- like getting your annual mammogram. It will feel good to cross items off your list. Colleen Curcio, who manages Ella centers in Langhorne, PA, Lemoyne, PA and Toms River, NJ, prides herself on ensuring that women receive high-quality care. She holds a license in radiology and mammography technology from the American Registry of Radiological Technologists and received training from Overlook Hospital School of Radiology in Summit, New Jersey.